My pepper plants are sick! I love peppers and fresh herbs so I started a little garden; at first everything was going good... Then aphids infested it!! I bought lady bugs and that seemed to work for a little while.... Now I have something else going on and it has really slowed and seems like whatever it is, is stunting the growth of the peppers. I literally bring each plant into the garage and wipe EVERY leave and it wont stop coming back! Help!! I have 2 types of jalapeÃ±o, anaheim, banana, and habanero plants and they look horrible. Re: My pepper plants are sick! 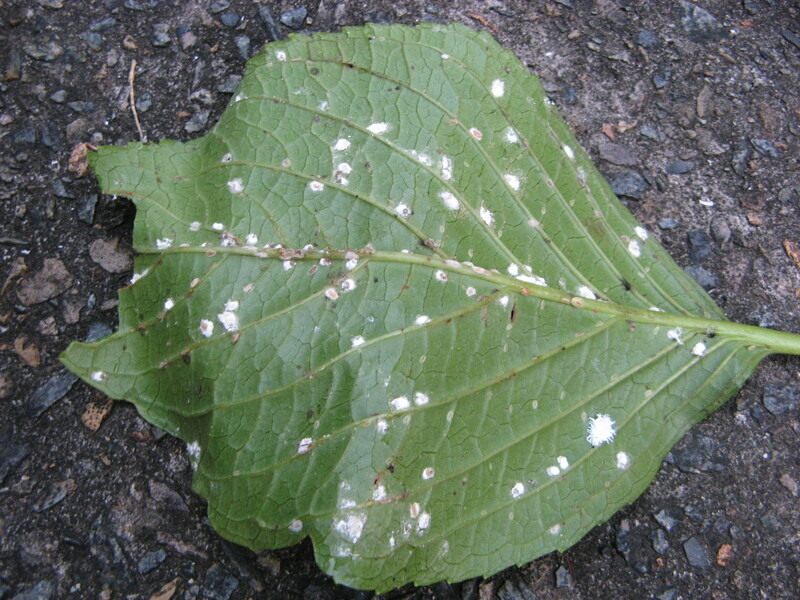 other possibilities include wooly scale insects, cottony cushion scale insect. But they are all plant-juice sucking insects and treatments are similar. Treatment options include Safer's insecticidal soap, diatomaceous earth, dabbing them with cotton swap dipped in rubbing alcohol. Ladybugs, both adults and larvae are predators of them as are lacewings. It helps not to over-water or over fertilize. Juice suckers are attracted to plants with lots of tender, juicy new growth. Your plants look so bad, because they are heavily infested and the life is being sucked out of them. One possibility for their repeatedly returning is that there are ants that keep moving them around or BRINGING them. Have you seen any? Worst case, they could have moved into the containers. I do use ant bait for the workers to poison the colony, and also use soapy spray to reduce the number of scouts and workers. If it's too cold outside to do this, covering the container and soil with plastic bag then spraying them down in the shower helps, too. How is the humidity? Are you misting the plants in the morning to simulate morning dew? The ladybugs -- are they still around? If successfully established, adults and their larvae will also eat these pests. Make sure you know how to recognize ladybug eggs and larvae so you don't accidentally wipe them out too. You could get something like a pop up mesh laundry hamper to create a "treatment room" to keep adult ladybugs inside with a plant. Watch out not to overwater which stresses the peppers, which in turn make them vulnerable to pests. Hopefully you have them planted in well draining potting mix. The light green container looks like the kind with inadequate drainage holes -- you may need to drill some extra holes along the bottom and up the sides. If you have the plants indoors, be sure to provide sufficient light right now while the temperatures are moderate (60's and above) and they are fruiting. And especially the one in the blue container should be pruned to thin out the growth a little. Mature pepper plants respond very well -and quickly- to pruning because they have established root systems. The big jalapeno in the first picture, too (which looks great BTW), could use some thinning out. Don't be afraid to cut off the spindly branches. You might also consider shortening the plant once the fruits at the top are harvested to even out the top of the canopy (this makes it easier to bring the plants and overhead lights closer for more intense light. Pruning like this to allow more light into the interior and lower leaves will also make it easier to inspect and treat the foliage in the interior for pests. I live in florida and until last week the humidity was very high. I keep the plants outside and I live in a townhouse so I only have limited space to work w. The pop up hamper is a great idea!! And I water them every day; there has been extra holes drilled into bottom but maybe I need more?? Should i be watering them every day? The first time I released some lady bugs they were around for days... Then I released a little bit every week until I used them all and they did a good job but now they are all gone. Or at least I think they are. I don't know what lady bug eggs look like but I'll definitely research it so I know next time since I am wiping every leave off. There are definitely ants around. What kind of bait do you use and where do you put it? So I can just harvest the jalapeÃ±o on the first tree and cut the branches down? Is there a particular way that needs to be done? I think your pots are too small for them. In big enough pots, you should definitely not need to water every day. Water thoroughly until water is running out the drain holes (and once it quits, maybe do it one more time to be sure all the soil is wetted). Then don't water again until the top inches of soil are starting to dry. The plants are definitely stressed which will make them better targets for pests. Make sure you are not overwatering. People tend to water more when the plants start looking sickly, but stressed plants cannot handle too much water. When my plant look like that I feed them with miracle grow and then I cut them back to the main stems. Definitely take care of the ants. I use terro bait. It takes a while to work. If you have the plants in the house and you don't have children or pets. I would cover the floor with plastic and cardboard and dust the board with boric acid. I would put the plants on top of that. If the ants are in the pots. It is harder to kill them. I would use the liquid terro bait and place the bait inside the pots. You have to take the bait out when you water and then put it back. What is this on my pepper plants? Need some advice on some pepper plants.